Over the last couple of years Google, and to a lesser degree Bing, have shared the spotlight when it comes to search. In fact, Yahoo! who above all other brands brought search to the masses has found itself slowly in a death spiral that it finds hard to get out of. Recently, Yahoo! has signed an agreement with Microsoft's Bing to provide search results, however on this innovation Yahoo! goes it alone to bring its customers Search Direct. Well according to Yahoo! 's vice president Shashi Seth, Search Direct is something revolutionary. In fact, he states that 3 words come to mind - Answers, not links! Yahoo! describes Search Direct as the fastest thing you have ever seen. So what is this amazing innovation? To boil it down, Search Direct is actually a combination of both - instant search results and answers - showing you choices as you are typing as well as instant answers. For instance, if you typed into the search box Houston A (for Houston Astros) you will see in the instant search box that Houston Astros does come up as the top choice. As being the top choice, an answer box appears to the right of the search showing several items of interest to Astros fans including their next game, their preseason wins and loss, a link for scores, stats and more. In addition, since I only typed Houston A, there are still other options in the instant search box that I can roll over including Houston airport, apartments, aquarium, all of which will give me instant information. 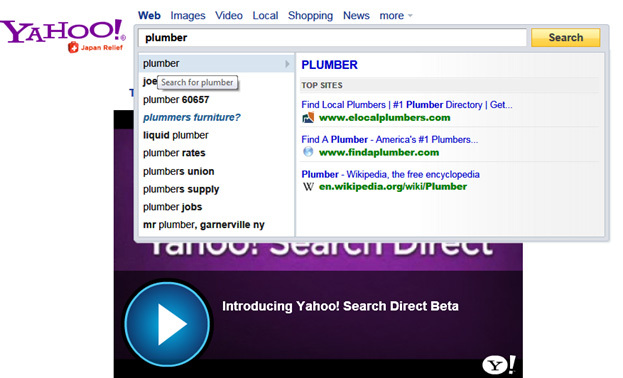 Below is a screenshot of Search Direct. Obviously, for popular search terms, Search Direct might be helpful to find information extremely quickly, but as you see below, for more general terms, the instant search might be helpful, but answers are too general, possibly filled with advertisements and too broad to offer any time savings. I also inputted uncommon keywords for my simple test and generally on the answer part of Search Direct it just states: no suggestions available. 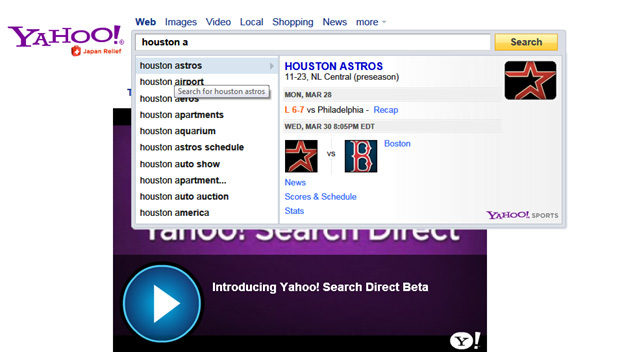 For those interested in trying out Search Direct, please visit the following link: http://search.yahoo.com/ Right now it is in Beta, but they do offer a quick video to explain how it works and the main advantages of this search tool. I am glad to see that Yahoo! hasn't completely given up on innovating search. While they continue to outsource their back end search to Bing - preferring to focus on usability, I definitely welcome their attempts to "shake up" search. Generally speaking, the more quick, convenient and fun to use search, the better it is for e-commerce sites and SEO/SEM professionals. Will it have an effect on results or ranking? As of now, there is no evidence to suggest that algorithms will change for this product. One thing to think about is for those professionals that target hot and trendy items; this might be a useful tool to gain more exposure. It seems that trendy searches are the ones that will garner the most attention from Search Direct users. For those with general keywords or less popular keywords, traditional search will continue to be the best way for users to find you.